The bright, young star left of center gives NGC 1999 its brightness. 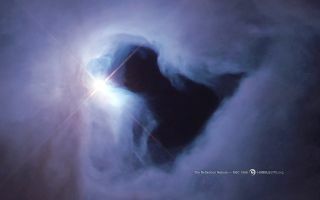 This cool space wallpaper shows the bright, young star left of center gives NGC 1999 its brightness. Reflection nebulae do not emit light on their own. They shine because of a light source embedded within, like a street lamp illuminates fog. The gas and dust of the nebula is left over from the star's formation.